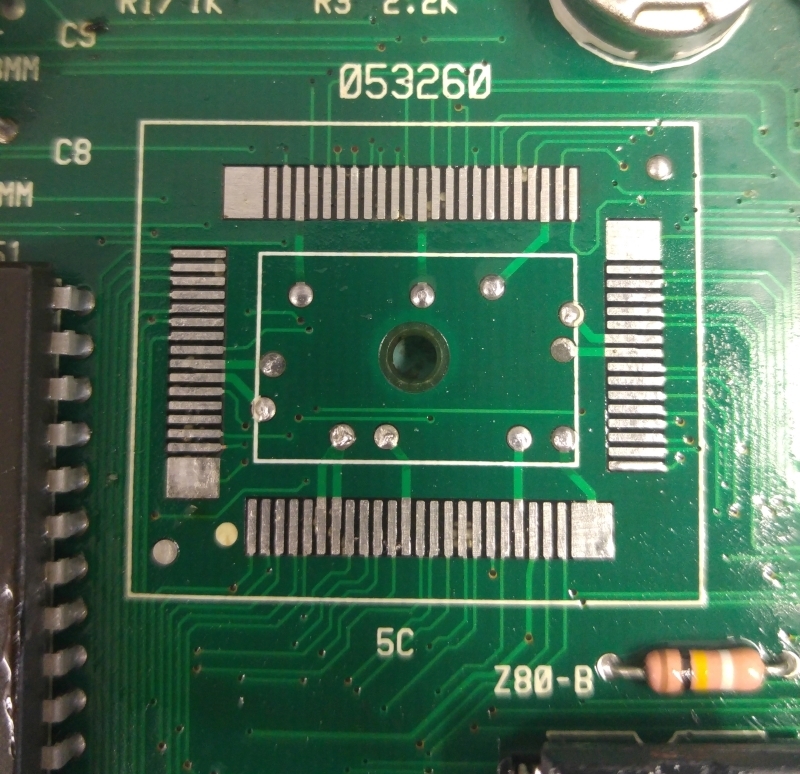 This Thunder Cross II board was stuck in a watchdog cycle. It was easy enough to bend this back a little without causing any damage. Powering up the game, it would sometimes show the RAM/ROM test screen from the POST with failures reported and sometimes it would just reset straight away showing nothing. Using a logic probe I quickly found the RAM at 1H and 16E were bad both of which had completely dead output pins. I piggy backed a known good working 6116 RAM chip on top of both of these and while it didn’t cure all my problems, on the time it booted to the test screen these RAM’s now showed clear. I replaced them and moved onto the resetting issue. The reset on this board is handled by a custom SIP package. 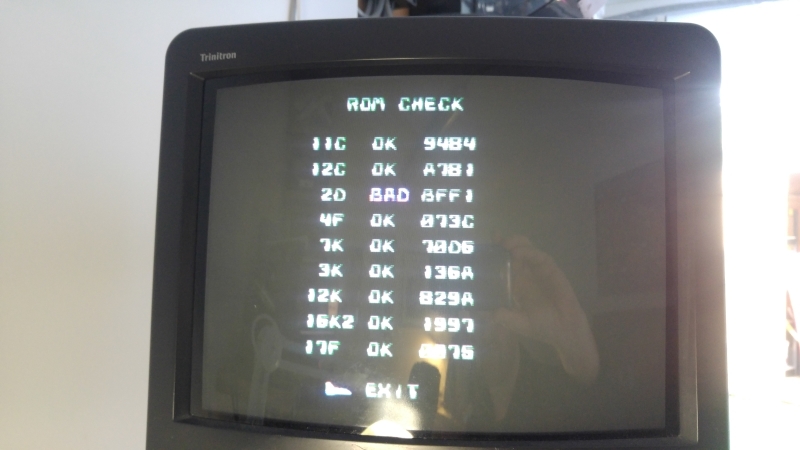 I was fairly sure this wasn’t to blame as on the occasions it booted up, if I held the TEST button down to reinitialise the EEPROM the game did not reset throughout the initialisation. I did notice a 4.7k resistor array was missing. I replaced this but it made no difference. Next I noticed the game booted up more regular if my hand was on the 68000 CPU. Things like this are a good indication that there is a floating pin somewhere. 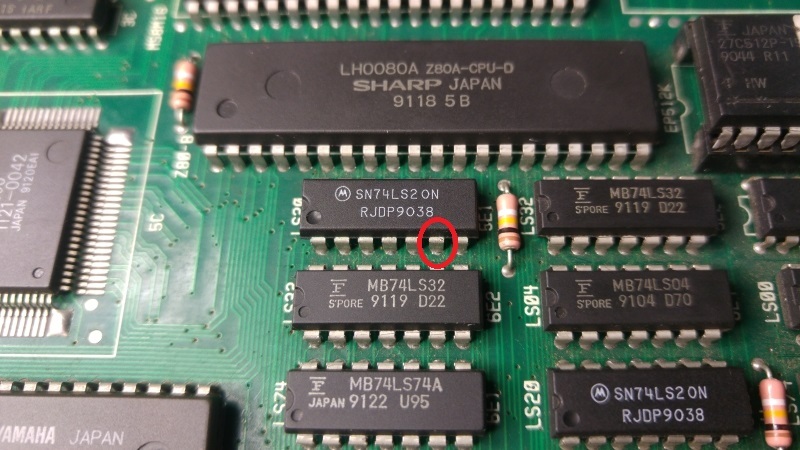 Probing the CPU pins revealed that pin 21 of the 68000 (/VPA). 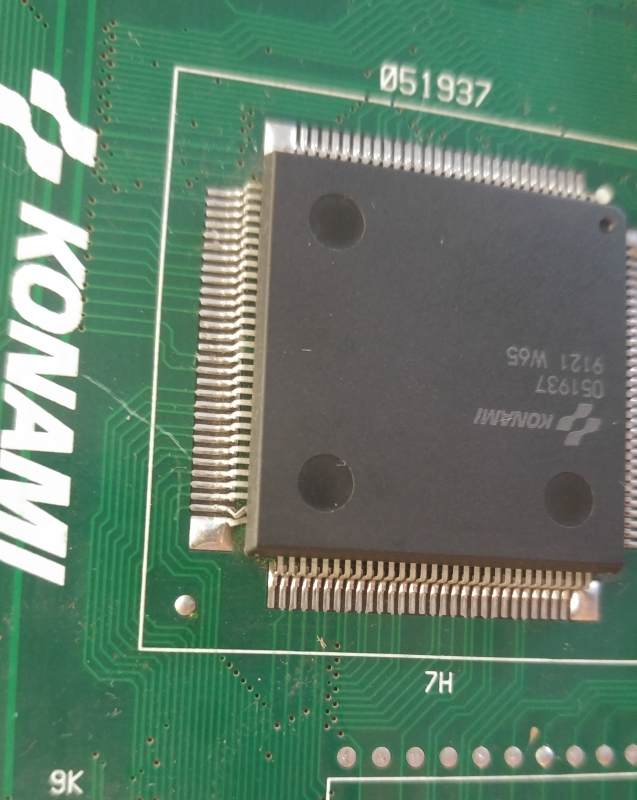 Chasing this proved difficult as there was a broken trace somewhere but these Konami boards have really small thin traces and vias. I eventually traced it back to pin 6 of a 74LS20 at 5E1. Jumpering this gave me a booting game. Everything initially looked good, the attract mode played and the sound effects were present. The problem came when some music played. To start with it sounded terrible but once the music stopped all the sound effects were either messed up too or were missing altogether. 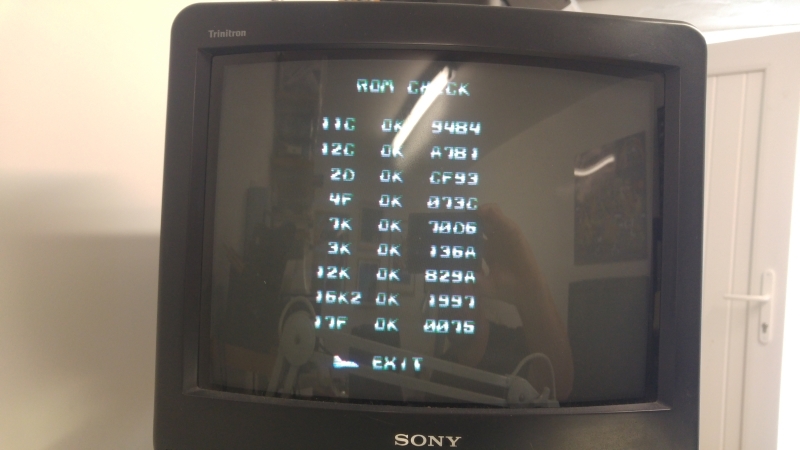 I had verified the ROM which checked out OK and sound effects were present. 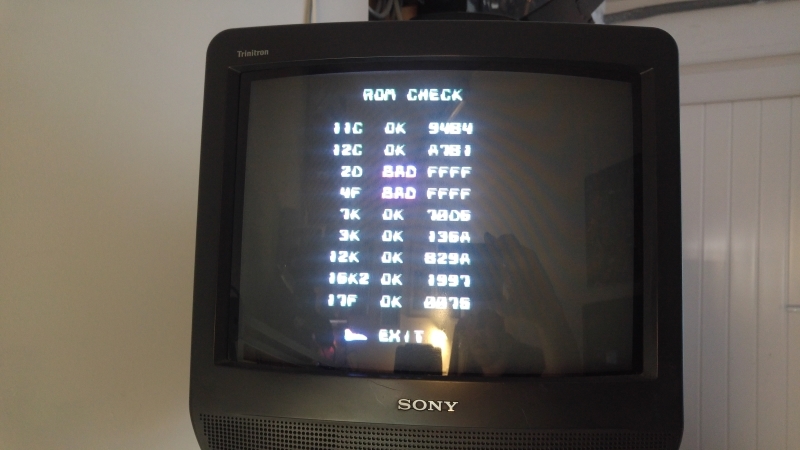 The music also attempted to play so I was fairly sure the CPU and ROM were good. I mapped out all the address and data line to the MASKROM and noticed that anything after address line A10 was dead. Looks like we have a dead custom. 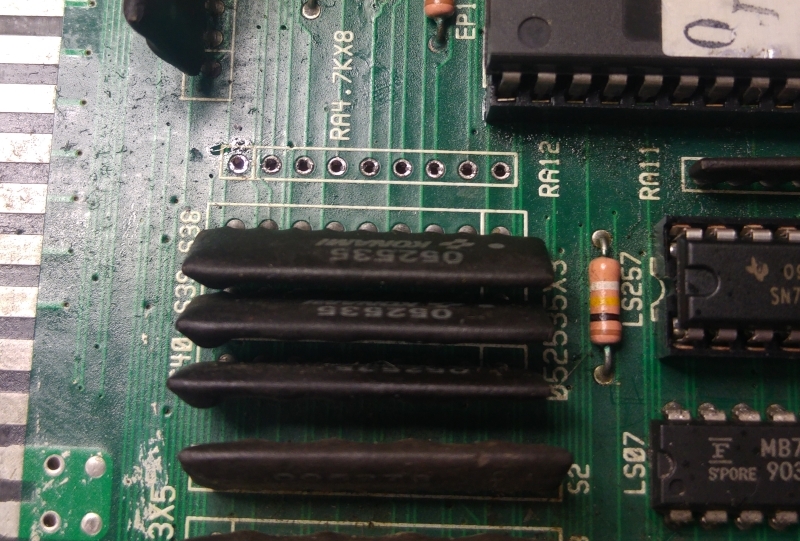 As it happens I found a scrap Konami PCB in the loft from which I could harvest this chip from. Replacing this gave me my sound back and the ROM tests now all pass. Its actually a nice shooter.